I have questioned published history my whole life, and have sought out the stories from the documents or in some cases the source. I was the obnoxious eight-year-old kid who went to Plimouth Plantation and posed my questions to the re-enactor John Alden. I did not ask standard questions like the rest of my class: “What do you do for work?” or “How do you survive without television?” I inquired of Mr. Alden who his parents were and where he was born exactly. The evil look I received back from the modern Mr. Alden was almost as bad as the glare from my second grade teacher before she grabbed me and led me out of the Alden home. Having a love for history at such a young age puzzled my school friends. I did a book report in the fifth grade on Alfred Poore’s nineteenth-century genealogy of my maternal grandmother’s family, A Memoir and Genealogy of John Poore: Ten Generations 1615–1880. My classmates were puzzled that I could have family that arrived in Massachusetts in the 1640s. The concept of a history stretching to great-great-great-great-great-great-great-great-grandparents and the Great Migration was alien to them. I even chose my favorite character from history – my great-great-great-great-grandfather Captain Jonathan Poor (1737–1807) of the 2nd Essex Militia, who marched on the Alarm of Lexington and Concord on 19 April 1775. Perhaps having lost all my grandparents by the time I was eleven years old made me wish I could travel back in time to know them. Perhaps it was for this very same love of and curiosity about genealogy that I decided to experience the past first-hand and try to understand my ancestors better. My grandmother’s uncle was a Massachusetts drummer boy who was wounded during the Civil War. I felt as a genealogist and historian that I needed to know something more than the textbook definition of a war veteran’s experience. So in 1992 I started re-enacting the Civil War as a private in Co. F., 12th Massachusetts Infantry. About a dozen weekend “Civil War” warriors met and marched in parades, and participated in re-dedications and reburials of Civil War veterans. Training in baseball fields and parking lots did not give me the taste of history I yearned for. For me the height of the historical adrenaline rush was re-enacting the battles. It was in 1993 at the 130th anniversary of the Battle of Gettysburg that I sensed for a few seconds the intensity and the heat of battle. For a brief moment it was no longer 1993 – it was now 1863. The sightlines of the spectators with popcorn and video cameras vanished from view. Somewhere in the chaos of hundreds of re-enactors, I felt for a few seconds what it might have been like in 1863. You may ask why I wanted to take my weekend, drive hundreds of miles, and sleep on hay in a makeshift tent? I wanted to honor the memory of my great-great-uncle Charles William Gale (1845–1920) and of all those who perished in and survived the war. This allowed me personally a chance to tell their stories better as a historian, and to begin to understand the hardships they faced – if only for a weekend. Yes, I researched the guns of the Civil War and tasted the black powder of the musket. 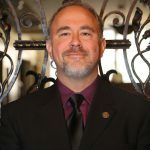 In recent years I have been honored to become a member of the New Hampshire Society of the Cincinnati, the General Society of the Sons of the Revolution, and most recently the National Society of the Sons of the American Revolution. As a Civil War re-enactor I carried and fired a 58-caliber 1861 Springfield musket. The Revolutionary War saw the era of flint-lock muskets – I yearned to know what Jonathan Poor carried and fired back in 1775. While at Colonial Williamsburg in Virginia last week I had a chance to fire both a British “Brown Bess” 69-caliber musket and an eighteenth-century flint-lock fowling piece. With my safety instructions, ear phones, and safety glasses, I was handed a loaded musket and positioned in a state of the art gun range. Out of the fifteen shots I got twelve on the target down the range. I hope my ancestor would be proud that I was a halfway decent shot! Every experience learning firsthand about the past is an education – a personal education which I hope never stops. To live in the past is not as boring as some might think. I find both the documents and the experience of re-enacting something everyone should try at least once in their life. Genealogy and history are a natural combination. You can not know one without knowing the other. Truly enjoyed your story. As a volunteer at Colonial Willismdburg, I am always thrilled to hear stories of people who have visited and “experienced” all the colonial capital has to offer. I have had some wonderful experiences in Colonial Williamsburg; we try to get over there at least once a year. It never fails to entertain or provide new information for us. Thanks for giving your time as a volunteer, Donna. David, I’ve never been into re-enacting, but I share your passion for the past. I consider the past as ever present with us in the long now, and sometimes susceptible to better understanding. I love that you asked the re-enactor who his parents were and where he was born. Genealogy is definitely in your genes! And just wonderful the things you’ve done to learn all about history and re-enact events of your ancestors’ pasts. This is inspiring. The re-enactors at Plimouth Plantation did better than that for me. I was there several years ago and asked one of them if he knew Francis Sprague, my 9th great-grandfather. One of them said that he did and mentioned where Francis was living. I work at an 18th c. historic home, and always try to remind our visitors that they too had ancestors who lived at the same time as the original owner of this house, and that they were all cooking over an open flame, etc. Many of them have never thought about it! Fascinating to hear you were actually in a re-enactment in Gettsyburg. What a moving and poignant experience to be following your uncle’s footsteps back in time. Whenever I visit Plimoth and “meet” one of my ancestors, I get a bit of this feeling on a much more modest level. Last month when I went on board the Mayflower II after its return to Plymouth, I felt a strange and haunting connection with those amazing passengers and gratitude for their courageous lives, some of which were so tragically cut short in 1621. 12 out of fifteen…what the heck is wrong with you? Do you know the expense of those 3 shots. You need to make every one count! Excellent – I empathize – I too want to know “what it was like” and have done re-enacting. Sometimes exciting, sometimes boring and every so often, terrifying! I am puzzled. One of the things a professional re-enactor would have to know, especially at Plimouth Plantation is where he came from and who his parents were. 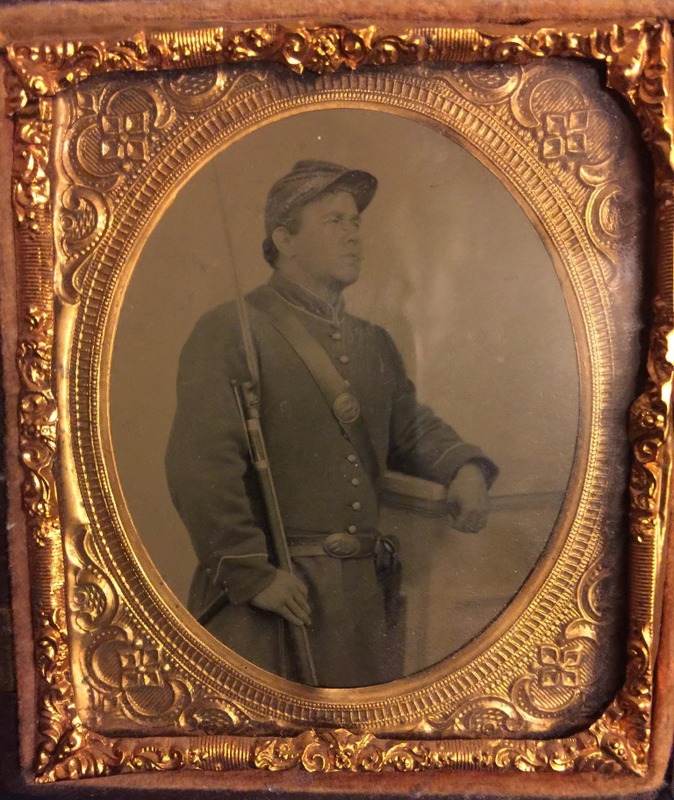 If you are playing an anonymous soldier in a Civil War battle, I could understand. I cannot understand John Alden not having been trained in his forbears. He is one of the most well known!! I tried re-enacting at Fort Number Four in Charlestown, NH but I couldn’t keep myself in the 18th century even though I knew the stories of my Simonds and Gardner ancestors who actually lived there. However, it was a pleasure to watch others from the inside who were really good at it reproduce accents and activities that were truly authentic. They never dropped their characters even when no one was visiting them. You have to be good at history and genealogy, and make believe to be a good re-enactor. Kudos to all the reenactors and the sites where they help those of us who don’t know what daily life was like for our great great . . . . grandparents. When asked what historical figure I would like to have dinner with, the answer has become my 10x great grandparents. Perhaps the same for you? The Fort de la Presentation Association will be hosting its Founder’s Weekend re-enactment of the French and Indian War July 16-17 in Ogdensburg, NY. An interesting pre-Revoluntionary War claiming New France for Britain. It’s takes place on the St. Lawrence River, the highway of north in the day. Great story! I, too, was a student of history at a young age, far more than were my peers. At least my history teachers appreciated me! I self-cultivated a love of old graveyards, and with the advent of the Internet, I can now google all those names! As a child, my parents made sure I visited all the Civil War and then Revolutionary War sites up and down the east coast as we traveled from MA to FL in the 70s and 80s. A very rich cultural heritage we have, if we only study it. Thank you, David, for your comments about reenacting the Civil War. I, too, felt from an early age felt the presence of Civil War veterans in our family. It burnished my love of history which I felt early on. 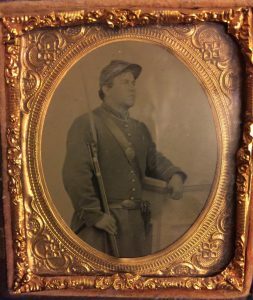 My ancestor, George Hull Ward, served in the 15th Massachusetts, and I did not hesitate to join the re-enactors representing that unit when I heard of them. At the 150th anniversary of Gettysburg, where my ancestor gave his life for his country, we took sixteen members to the event, among whom were five direct descendants of the original members of the regiment. At the conclusion of the event, we gathered at the 15th Massachusetts marker on Cemetery Ridge, where we felt the presence of those whom we represented by our participation. Four months later, we returned to Gettysburg to march in the annual Gettysburg Remembrance Day parade.